Your world-class solution to fighting spam and email viruses is right here. 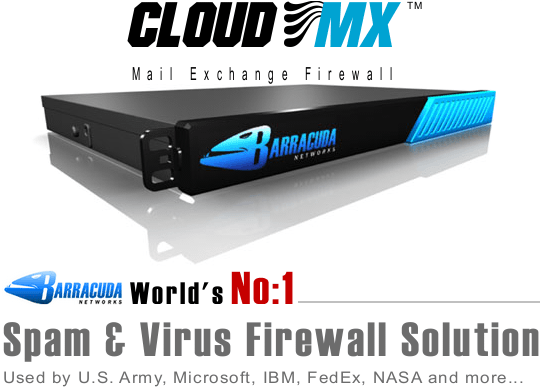 Barracuda's Spam & Virus Firewall solution is used by goverment agencies, ivy-league universities, and fortune 500 companies -- including The U.S. Department of Defense, Harvard University, The U.S. Army, Microsoft, IBM, FedEx, and NASA. This elite system uses the Bayesian learning system to decipher what is - and isn't - spam. Anything it's not sure of will get quarantined so you can check it in a secure environment, without worrying about having viruses injected onto your computer. UnlimitedGB's Corporate Emailing Solution with CloudMX & Barracuda Firewall is designed for organizations dealing with high volumes of mail, requiring greater control and flexibility over mail services. CloudMX adds highly functional features such as collaboration, Outlook synchronization, SPAM Rules and SPAM Filtration, and email administration - giving you the power and control required for large-scale operations. → Accurate Spam Filtering with 99.999% of spam removed from your email. → Guaranteed 0.0001% False Positive Rate. → Includes Anti Virus and Malicious Email Filtration. → Includes Spam, Phishing and Malware email filtration. → Blocks Dictionary Attack emails. → Blocks Email Spoofing and and other email attacks. → Ability to write additional blacklist rules. → Distributed US UK & EU Cloud Servers to ensure 100% Uptime and reliability. → Backup mail server and disaster recover mail spooling included. 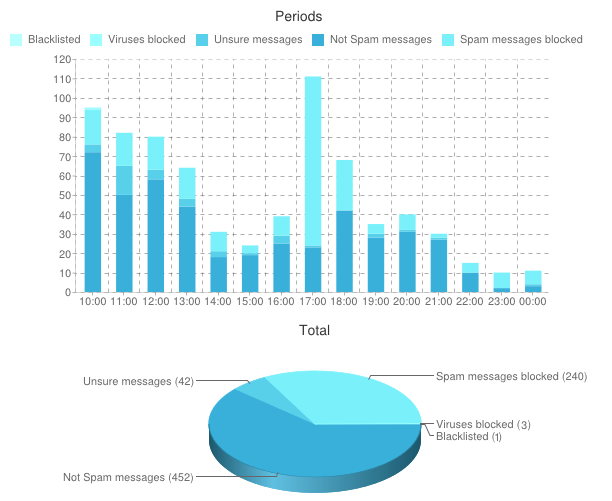 → Daily Spam Digest Quarantine Email Login anytime to view reports and your quarantined email. → Simply click a link to release a quarantined email you wish to view or receive. → 24/7 updates to our spam filtering rules being applied every 5 minutes by real humans. → Fully managed solution so you do not need to worry or waste time with spam again. → Could be used as an addon service with your any/existing hosting provider. Multiple barracuda spam firewalls are clustered together... so... if one fails... another will take over the workload. Avoiding you the embarrassment of friends, family, and customers seeing errors when trying to email you. Additionally in the rare event your web-site is down, due to server maintenance or a hardware failure -- the barracuda spam firewalls will hold your email until your web-site is back online. The core layer for threat identification are the spam signature files, these signatures are created and managed by human spam editors who look at spam 24x7x365. Barracuda release new spam updates every 5 minutes to ensure that our network has the latest rule sets to defeat spam attacks as they happen. Barracuda's Firewall Architecture uses a layered approach that maximizes kill rates and minimizes false positives. Spam signatures are designed around actual identified spam. The system isn't guessing at identifying incoming email which is why the false positives are the lowest in the industry. CloudMX's anti-spam engine, was designed from the ground up to protect your message while taking care of spam, viruses and other email threats. For over four years CloudMX has been eliminating spam from email for over 2 million mailboxes world-wide. 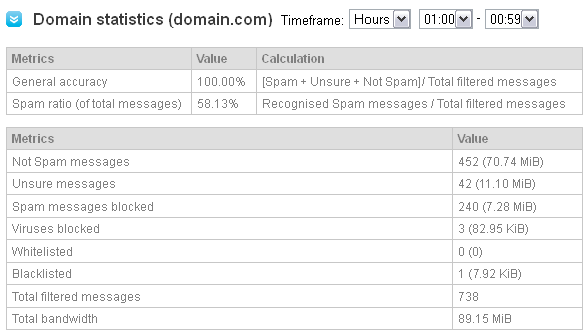 CloudMX is very effective at killing spam, but the real benefit is in our false positive rates. We lead the industry with a false positive rate of less than 1 in 1 million. Some customers have seen only one false positive in over four years of service. CloudMX is a 'hands off' system meaning that administrators and end users are not spending time managing the system for rule creation, etc. What happens to the SPAM? 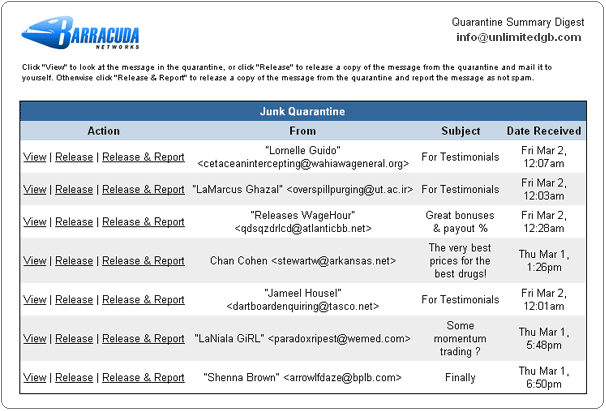 If an email is flagged as Spam it's not deleted but quarantined on the Barracuda Firewall for 15 days. You will be sent an email digest at 5am every day morning which will contain a list of the emails that have been filtered out by the Barracuda system, this should contain 100% pure spam but gives you the option to read the emails and release them to your inbox if required. 100% White Label Solution, with only Barracuda brand name. Percentage of "SAVINGS" is calculated based on Regular Single Domain Firewall Pricing.